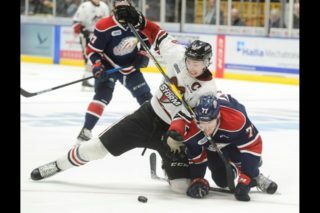 After earning a big win over the Owen Sound Attack on Friday, the Guelph Storm were on the other end of things on Sunday afternoon. 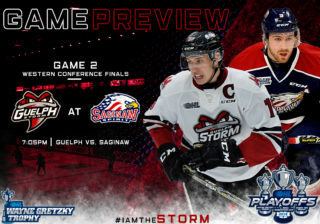 Wrapping up the weekend – a two-game home stand – the Storm fell 7-3, playing host to the Canadian Hockey League’s number one ranked squad, the Sault Ste. Marie Greyhounds. The score doesn’t indicate how close the Storm did come at one point, scoring two goals to climb back into the contest, making it a 3-2 game for most of the second period. That was as close as it got, though, with the Greyhounds registering four more in the latter half. An easy bright spot in the loss comes in the shape of Keegan Stevenson registering his first career OHL goal. 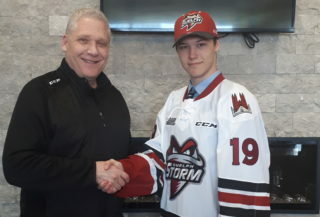 Other goal scorers for the Storm were Alexey Toropchenko and Isaac Ratcliffe. In the paint, Anthony Popovich got the nod, facing 35 shots in the loss. For the Greyhounds, Matthew Villalta turned aside 30 of 33 Storm attempts, while Barrett Hayton (one goal, two assists), Morgan Frost (two goals, one assist), and Boris Katchouk (one goal, two assists) led the way offensively. To start the game, the visiting Greyhounds came out ready and ready to go early, jumping ahead to a 3-0 lead before the five minute mark of the first, courtesy of goals by Frost, Jack Kopacka, and Hayden Verbeek. 1:11 after the third goal against, the Storm got on the board off a scramble in front with the goal being awarded to Toropchenko, making it 3-1 at the 5:32 mark of the first. Ratcliffe pulled the Storm within one 3:10 into middle frame as Nate Schnarr capitalized on a turnover, feeding the Philadelphia Flyers prospect for his 19th of the season, but that was as close as the game came on the scoreboard. The Greyhounds grabbed the next three goals – two coming in the latter half of the second and one in the opening minutes of the third – to make it a 6-2 contest with 16 minutes left on the clock. Nearing the halfway point of the third, Stevenson celebrated his first career OHL goal, making it 6-3 with a picture-perfect (for a career first) breakaway goal, but the Greyhounds netted a shorthanded tally just short of three minutes later to round out the 7-3 final. Next up, the Storm hit the road, visiting the Peterborough Petes on Thursday, the Kingston Frontenacs on Friday, and concluding the weekend in Ottawa on Sunday afternoon. 1st Period-1, Sault Ste. Marie, Frost 23 (Katchouk, Gettinger), 2:46 (PP). 2, Sault Ste. Marie, Kopacka 20 (Hayton), 4:03. 3, Sault Ste. Marie, Verbeek 14 4:21. 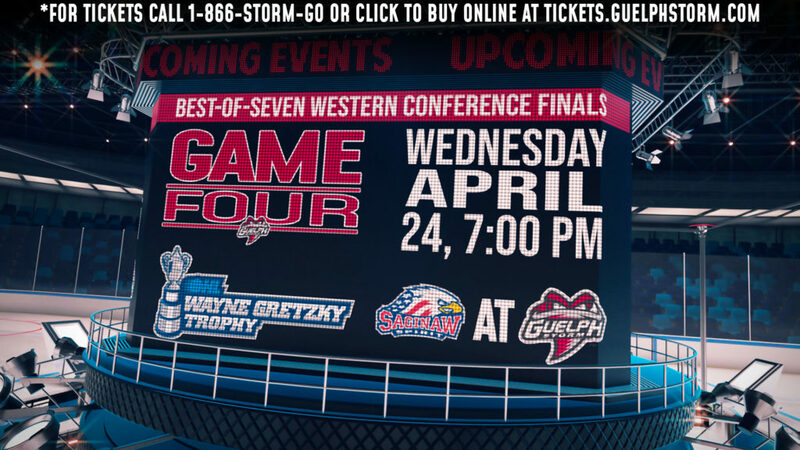 4, Guelph, Toropchenko 6 (Hawel, McEwan), 5:32. Penalties-Lalonde Gue (tripping), 0:46; Kopacka Ssm (interference), 5:53; Ratcliffe Gue (delay of game), 10:45. 2nd Period–5, Guelph, Ratcliffe 19 (Hillis), 3:10. 6, Sault Ste. Marie, Hayton 16 (DeMeo, Katchouk), 12:58. 7, Sault Ste. Marie, Roth 10 (Kopacka, Sandin), 18:19. Penalties-Sandin Ssm (interference), 4:40; Katchouk Ssm (elbowing), 10:18; Lalonde Gue (inter. on goaltender), 16:10; McFadden Gue (delay of game), 16:15. 3rd Period-8, Sault Ste. Marie, Frost 24 (Hayton, Gettinger), 3:47 (PP). 9, Guelph, Stevenson 1 8:33. 10, Sault Ste. Marie, Katchouk 28 (Frost), 11:16 (SH). Penalties-Primeau Gue (tripping), 3:33; Frost Ssm (tripping), 6:07; Roth Ssm (high sticking), 9:46; Timmins Ssm (interference), 19:21; Shoemaker Gue (slashing), 19:57. Shots on Goal-Sault Ste. Marie 16-10-9-35. Guelph 6-13-14-33. Power Play Opportunities-Sault Ste. Marie 2 / 6; Guelph 0 / 6. Goalies-Sault Ste. Marie, Villalta 25-2-1-1 (33 shots-30 saves). Guelph, Popovich 18-12-1-2 (35 shots-28 saves). Referees-Dave Lewis (16), Craig Dease (39). Linesmen-Dustin McCrank (68), Chris Chapman (50).